Successfully Added Wi-Fi Signal Booster (Wireless Signal Amplifier) to your Shopping Cart. Wi-Fi Signal Booster (Wireless Signal Amplifier) for wi-fi networks used in homes and small businesses. Wireless network (WLAN) and wireless internet access points are very convenient, no doubt. But what do you do if you are in a building with architecture or materials that seem to limit wi-fi signals? Or what if your small business has a router in the office and you cannot seem to get a signal out in the warehouse? With the CVSD-K31 you can increase the signal distance and bandwidth throughput of your wireless network - making your wireless network work better for you and allowing you to be more productive. 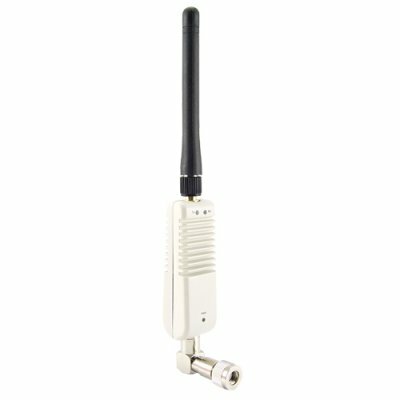 The Wi-Fi Signal Booster (Wireless Signal Amplifier) consists of a wireless signal booster to attach to your wireless access point/router and a power adapter. You simply attach this unit to your existing WiFi device, power it on and that is it! Don't continue to be frustrated by the limited range of your current wireless network when with one simple product can help you achieve so much more! Buy today at Chinavasion's excellent wholesale prices and get it sent direct to you or your customers door from China with the confidence of our famous 12 month warranty. Designed for Wireless Routers and Wifi Access Points (such as 802.11B and 802.11G routers from Belkin, Linksys, D-Link, Netgear, 3Com, etc.). I live in a two-story house, will this help me? YES IT WILL. If your router is in the study downstairs and you are having trouble getting a signal up in the second floor bedroom then you need this product! on 2010-04-28 22:31:25 It really works! This is a very good product! I use is with my Revo Pico Internet Radio. Without the Wi-Fi Signal Booster, I have an unstable signal, 1 line out of 10, but with the Wi-Fi Signal Booster the signal is very stable, 5 lines out of 10! If it has a power button, it would be perfect. Now I unplug the power cable to turn the signal amplifier off.